↑ 1,0 1,1 Taylor K. CHAPTER 3 (part2): Modernizing the Old. The Creation of a 'Traditional' Chinese Medicine, 1953-6 (չաշխատող հղում — պատմություն) // Chinese Medicine in Early Communist China, 1945-63. A medicine of revolution.— London: RoutledgeCurzon, 2005. «TCM is a medical construct distinct to Communist China. 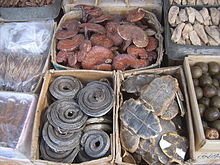 The term refers only to Chinese medicine from mid-1956 as located in mainland China. I will therefore adopt the convention of using the acronym TCM to describe only the standardized, government-created, institution-bound medicine that has existed in the PRC since 1956. This is quite distinct from the general, uncapitalized term 'traditional Chinese medicine' which refers to past forms of Chinese medicine in general. I believe that it is heuristically useful to make this distinction of TCM as a modern subset of contemporary Chinese medicine, because it allows us a certain consensus among scholars». «Chinese medicine henceforth became known as „Traditional Chinese Medicine“ (TCM) to refer to the state-sanctioned practice of Chinese medicine. It was „traditional“ only in the sense of having originated from the classics of Chinese medicine and being a different system from modern Western medicine. But in fact it was a new system that reflected the social and political milieu of modern China. The first national textbook appeared in 1958, titled Outline of Chinese Medicine (Zhongyixue gailun 中医学概论). It was superseded by other specialized texts covering foundational theory, diagnostics, acupuncture and moxibustion, material medica, prescriptions, internal medicine, pediatrics, gynecology, skin diseases so forth. The structural similarity of these textbooks to their Western medical counterparts was obvious and deliberate. The textbooks constituted a massive systematization of medical theory and practice, the first to appear in Chinese history». «…They should learn how to use modern science to explain the principles of Chinese medicine. They should translate some classical Chinese medicine books into modern language, with proper annotations and explanations. Then a new medical science, based on the integration of Chinese and Western medicine, can emerge. That would be a great contribution to the world».